Today the weather dropped to near freezing temperatures, and we even had some sleet. It wasn’t enough to cause any school closures, but it was still way colder than I like. I could never survive in a place that has a long winter! Even with the frigid temperature, we went to get frozen yogurt this evening at the local Froyoz. Actually, it was just Koa who got anything. 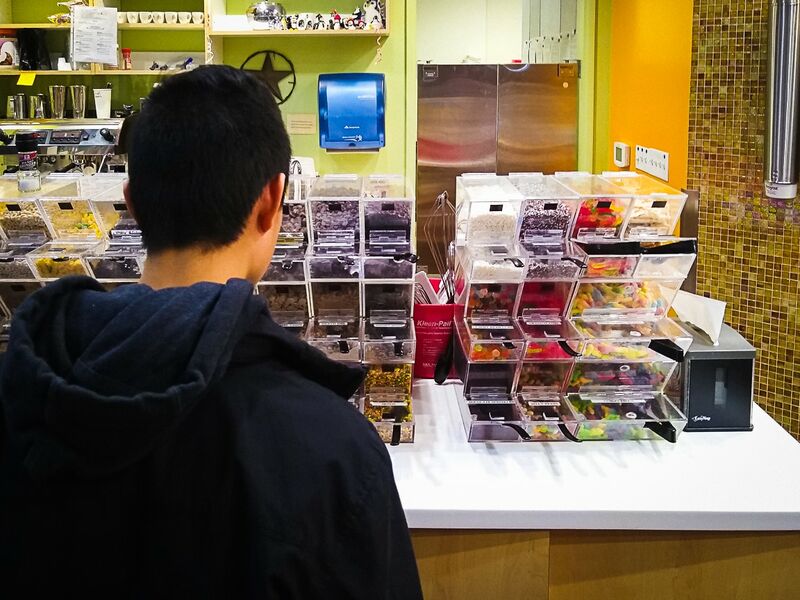 I’m always surprised how many choices there are for toppings at the frozen yogurt shop – there’s the regular items like sprinkles, crushed Oreos, and gummy bears, but also some newish toppings like marshmallow creme, kiwi boba, and cheesecake bits. It’s like a candy store! We rarely go out for ice cream or frozen yogurt, so I didn’t mind taking Koa this evening. Just hope it doesn’t turn into a habit!